This project has not been released to the public. Details and text have been filtered and heavily edited to uphold confidentiality. 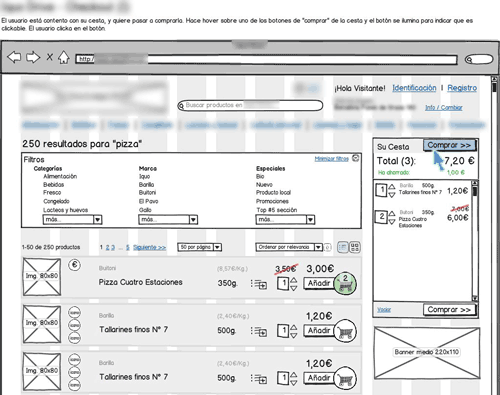 Tempos21, part of Atos Origin, had to build an online supermarket front-end around their eCommerce back-end. 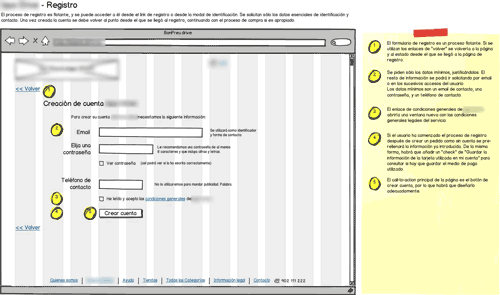 They contacted me to help shape the User Experience of the service and create its Information Architecture. 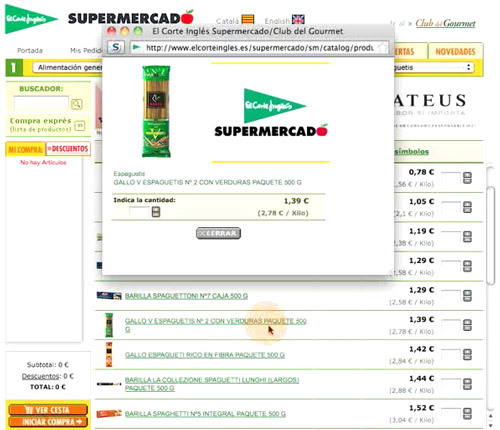 In this case, it was meant to be an online supermarket. Creating an Information Architecture that would accommodate so many different products while helping customers find the ones they really want was not an easy task, but the results look promising! One of the biggest challenges of this project was time, which was really limited. I would not be able to conduct a lot of research, and I could be easily delayed trying to prepare user interviews. I needed results as soon as possible. But to get good results, some research is mandatory. 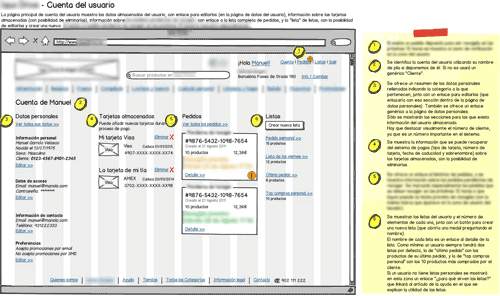 In order to get a lot of information in the least amount of time I used what I call “task-oriented competitive research”, which is just a way of focusing competitive analysis. Instead of evaluating wide heuristics for potential competitors, I select some primary tasks and carry them out on competitor’s sites. I proceed to record myself while going through these tasks (using Silverback) and talking out loud. I try to play a customer’s role as much as possible, while also taking notes on heuristics. I look for great ideas and points of friction (those moments when “flow” is broken), and end up creating a list with ideas that might be worth considering and issues that have to be avoided. 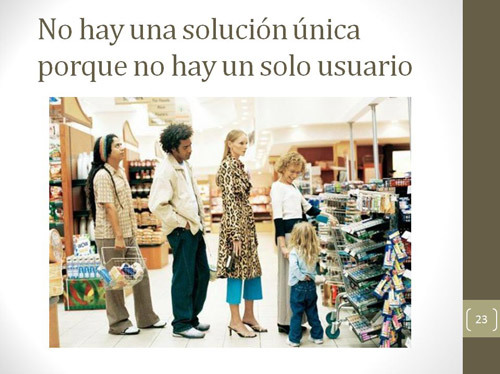 At the same time I was reviewing documentation on the eCommerce back-end (my experience working as Functional Analyst pays off when dealing with that kind of documents), and also applied the task-oriented competitive research to other front-end implementations of that back-end, which were already in production. Once I conducted all feasible research I started sketching main pages and flows, while meeting with Tempos21 team to get their feedback. Also, showing them some of my previous work while taking a look at theirs helped setting expectations and creating a mutual trust climate. 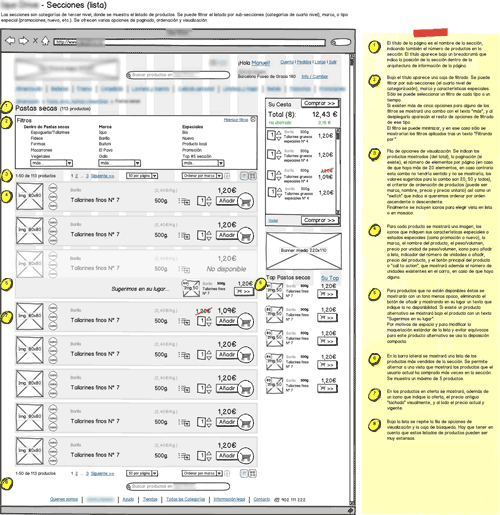 As ideas started to consolidate I started creating annotated Balsamiq wireframes for the different pages. 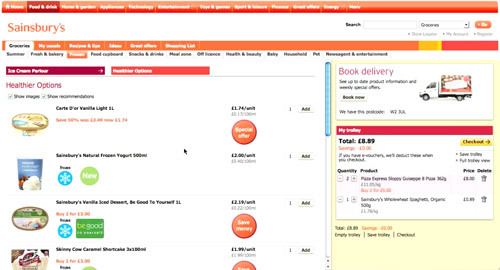 Order confirmation page uses white space and icons to group and categorise the information. 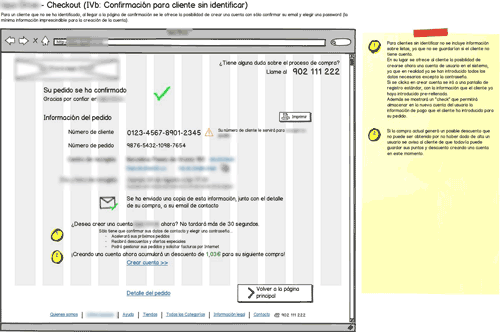 When an unregistered customer reaches this page she is offered the chance to register, allowing her to keep fidelity rewards based on this order. 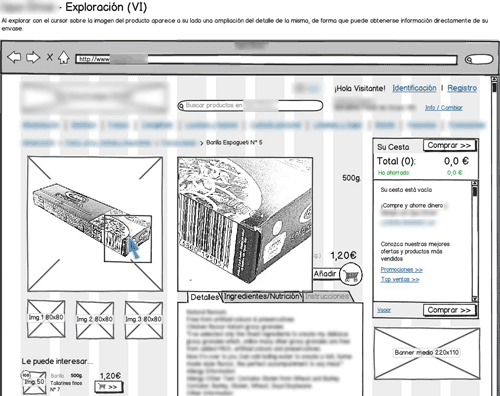 A lot of online supermarkets need registration before ordering, and the requirements document for the project stated such. We have all heard Jared Spool’s $300M button story, so I felt my duty to convince our client that while having registered customers is great, you have to earn their trust first. I expected the usual resistance, but to my surprise our client loved the idea (all in all I have to admit that I was lucky having a client that listened to our suggestions while offering us his thoughtful feedback on them), and registration-free ordering was included. Email, password and contact phone. This is all it takes to create a customer account here. 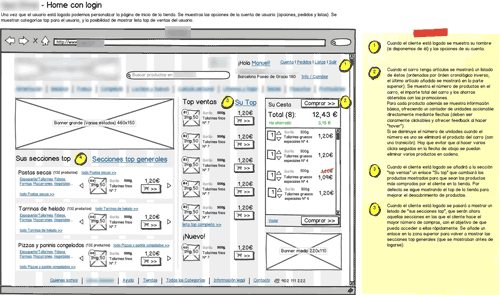 Some flows are best understood by creating step-by-step wireframes for them. 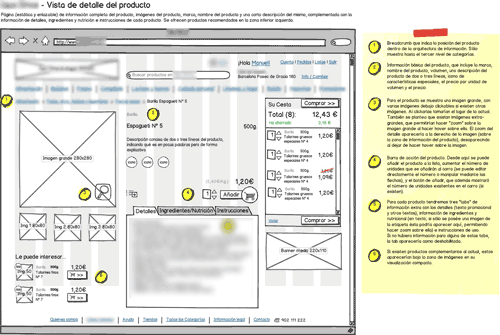 Once the static wireframes had been created, working on them to create the step-by-step ones did not take that much time and enhanced communication with our client. 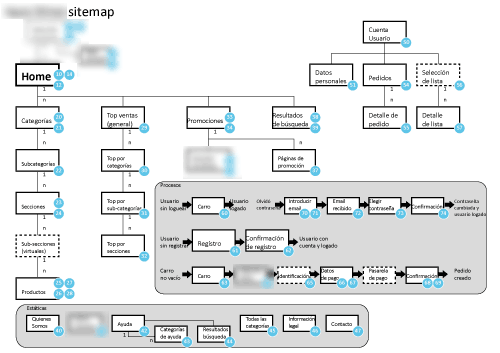 Once every page was consolidated it was time to create a final sitemap. 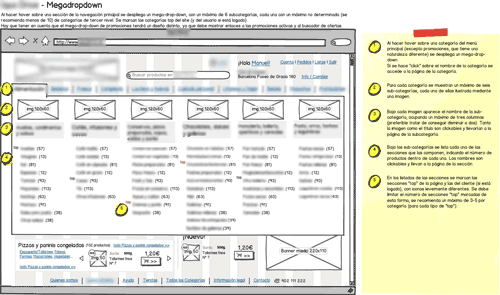 Provisional sketchy sitemaps had been created (and updated frequently) during the wireframing process, but any final sitemap has to be created bottom-up, from individual pages to the home page. When everything was ready to meet the client and show them our work, I created a simple User Experience presentation to have them better understand the reasoning behind our Information Architecture proposal. My work was well-received, including a personal congratulation from our client, and the site is currently in development. My first “big” freelance assignment: Managed my time to comply with tight deadlines, integrated with internal development and design teams, and communicated my work successfully. 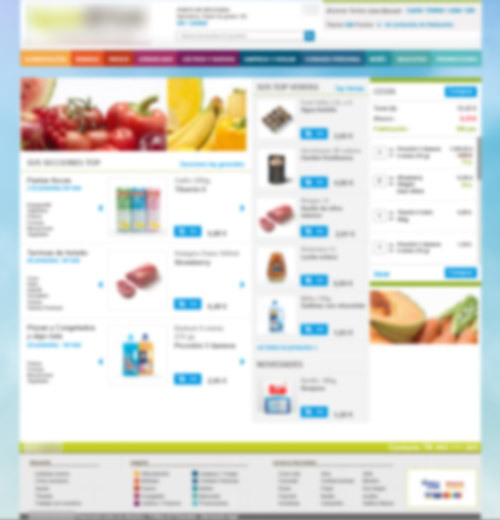 eCommerce experience in a big inventory site.